So yeah. 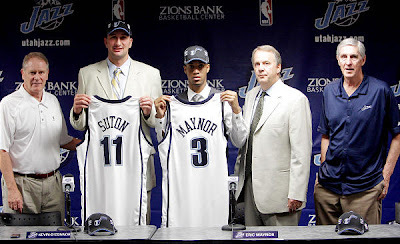 Eric Maynor and Goran Suton. All the sites and all the analysis have my head spinning, but from what I gather, Maynor is a pure PG with great leadership skills, has no qualms about taking the last shot with the game on the line, and is one of the most NBA-ready point guards in this year’s draft class. Suton, meanwhile, is a good rebounder and good shooter for his size and has a back story that few of us can imagine. That’s the good. The bad? Maynor’s weaknesses, according to Draft Express, include “ability to defend position at next level?,” “commitment to playing defense,” and “defensive fundamentals” (in other words, he will fit right in with the rest of the Jazz roster. ARGH!). Also somewhat worrying is that he only weighs 165-175 lbs. Suton, meanwhile, might lack the athleticism to make it in the NBA and several sites seem to think he will be gaining experience in Europe next year. Great story: During the introduction press conference the next day, it came out that Jerry killed eMay’s dad’s NBA dreams by cutting him from the Bulls back in the day. Jerry also got a laugh out of me when he told Suton he had four days to get into shape because training camp starts on Tuesday. Loved the music note logo caps the guys were sporting at the press conference, by the way. Finally: If I’m Maynor, DJ and PK would be at the top of my sh!t list after their shameful show this morning. Listening to the podcast and hearing them mock and imitate Maynor’s mom, who was understandably emotional after seeing her son drafted, made me cringe about 100 times in 15 minutes. 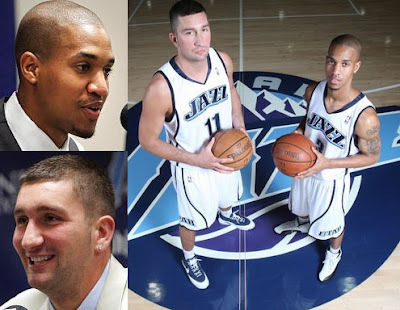 Seriously, they made me ashamed to be a Jazz fan. P.S. Typical me and my general ignorance of what is going on in the world–I found out about Michael Jackson through a comment on the SLC Dunk draft thread. RIP.